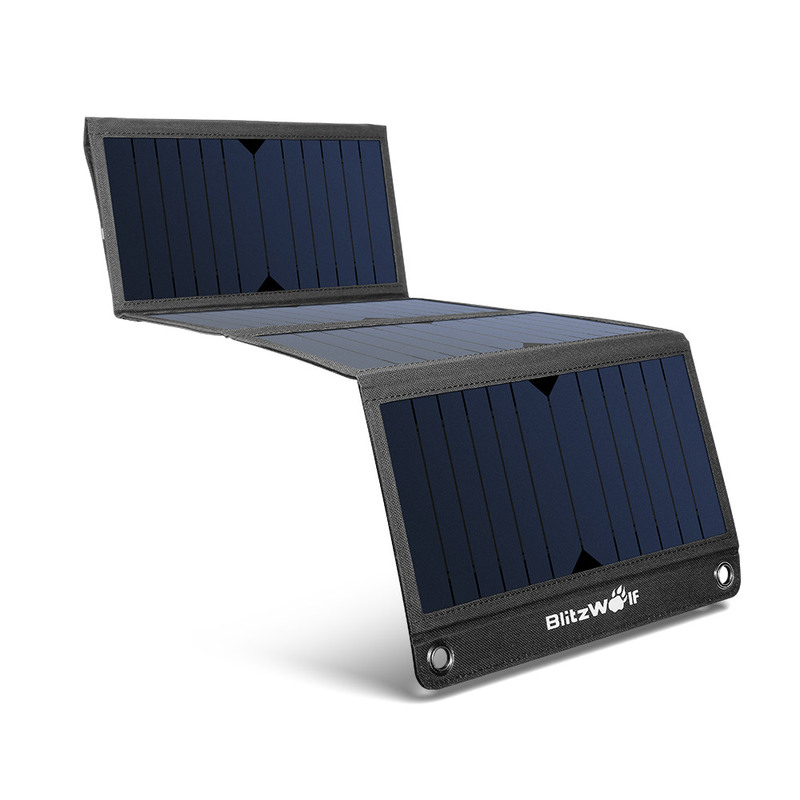 New BlitzWolf® BW-L3 four panel 28W solar panel is on its way!!! Since many of you have request such product in the past, I think there is definitely a demand for their upcoming model. 1. Powerful SunPower Solar Cells. 2. The transformation efficiency of SunPower is up to 23.5%, most other similar products on the market are 15% or less. 3. Dual Port Power3S Technology. 4. Intelligently identifies connected devices and provides fast charging for up to two devices simultaneously. 1. The BW-L3 is not charging my device, what can I do? (1) Check to ensure the panel is at a 90-degree angle to the sun. (2) Cloudy weather or indirect sunlight can cause fluctuations in output that slows down or stops your device from charging.To remedy this, try placing the BW-L3 in more direct sunlight or wait for the weather to clear. (3) Check to ensure that your device’s input current and voltage requirements fall within the accepted range of the BW-L3. (4) The Power3S circuit will identify your device before beginning to charge it. Identification of the connected device can take up to 2 minutes. (5) Devices, such as the iPhone have an internal temperature sensor. When the device is too hot, it will automatically shut down to prevent damage to the battery. If your device has overheated, wait for it to cool down and try again. We recommend you place all devices in the charging pouch or a shade covered area to prevent overheating. 2. How do I check my device's input current and voltage? Please refer to your device’s user manual, original OEM charging adapter or contact the manufacturer to determine this information. 3. Can I use the BW-L3 to charge a power bank or Bluetooth speaker? Yes, the BW-L3 is capable of charging any regular USB device. 4. My iPad/iPhone is not charging or is charging slowly, what can I do? (1) Ensure the panel is at a 90-degree angle to the sun. (2) For an iPad: We recommend connecting the BW-L3 to an auxiliary power bank first and then charge the iPad from the power bank. If you are charging an iPad directly with the BW-L3, and the panel is generating less than 0.8A (low sunlight conditions),the iPad will not indicate that it is charging, but it will be slow charging. (3) iPhone: The iPhone has an internal low current cutoff and will not charge if the BW-L3 is producing less than 0.8A. 5. How long does it take to charge my device completely? 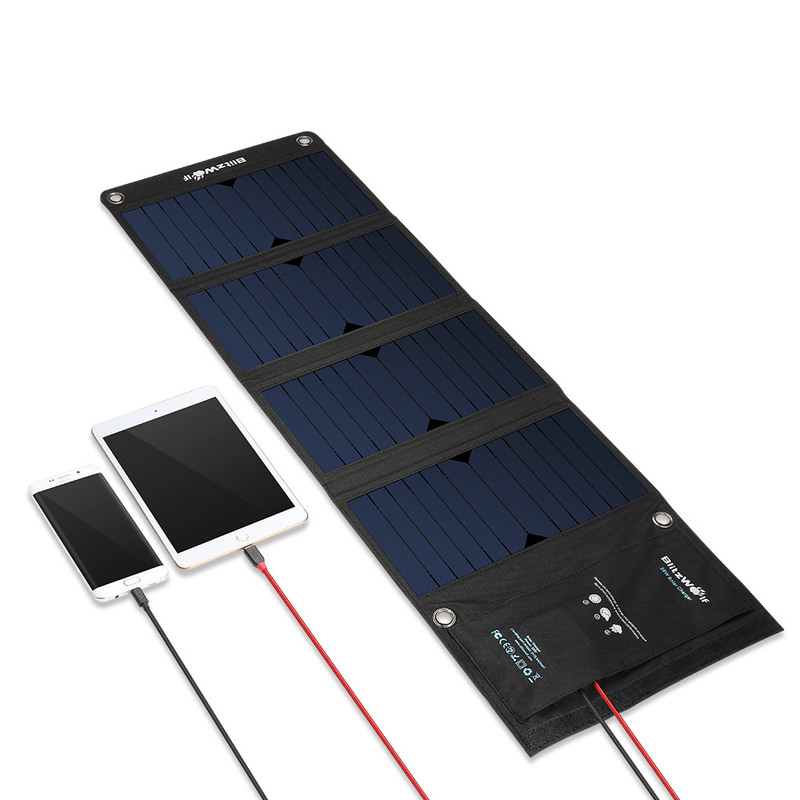 Provided the sunlight is adequate, and the panel is at a 90-degree angle to the sun, most modern smartphones will charge in under 4.5 hours. In cloudy, overcast or other low sunlight conditions, your device may take longer than usual to filly charge. The total charging time also varies based on your device's battery capacity and input charging current; we recommend you consult your device's user manual for more details. 6. How long is the life span of the BW-L3? The PET panels will gradually fade when exposed to the sun resulting in reduced output over time. If used properly, the life span of the solar panel is approximately 4 to 5 years. After this time, the panels output may be too low to provide an adequate charge. (where it stops charging) and then back into the sun, it does not start charging my device again? When moving the BW-L3 from shade to sunlight, you need to reinitiate charging by disconnecting and reconnecting the device. If the device is not disconnected and reconnected, it can take up to 10 minutes for the BW-L3 to resume charging the device. The exception to this procedure is the iPhone; you do not need to reinitiate, it will quickly resume charging when moved back into the sunlight. For those who are unfamiliar with BW charger, here is a full review of their three panel BW-L1 (over 3000pcs sold to date). Interest List (reply in this thread if you are interested - NO PM please). 20 Watts is a LOT. But with the black fabric everything will get very hot in the sun, won’t it? I’m already have this one. But I want one more). How is it? What can and do you charge with it? For hot sunny day, I think it is better to keep the charging device (mobile phone, powerbank ,etc) under shade. Skip to 2:30 when he finally unfolds it... Nice gadget ! 20 Watts is a LOT. But with the black fabric everything will get very hot in the sun, won't it? Interested if price is right! Please add me to the list. I’m interested if the price is right. Thanks. Interested but need a review. I am in for (4) please. Interested. Please add my name. My interest depends on the price, though.